The HC-X1 was introduced on Wednesday at the IFA trade show in Berlin and will be available later this year. At the top of the new-feature list is a 1-inch image sensor -- a considerable improvement on the 1/2.3-inch sensor in the two-year-old HC-X1000. The larger image sensor allows the camera to collect more light, which means better low-light performance, but at a cost. The extra data captured by the image sensor still needs to be processed in real time, and that can cause problems with autofocus, especially during fast-moving events like sports, Panasonic said. The answer is a new autofocus system that can analyze the data and still work fast enough for sports. In front of the image sensor, Panasonic has a Leica lens with a 24mm field of view and 20x optical zoom. That compares to a 29.5mm lens on the HC-X1000 and means the camera can capture a wider swath of the scene in front of it compared with its predecessor. The rest is what you'd expect from a camera in this class: three manual rings on the lens barrel for zoom, focus and iris; XLR audio inputs; 3.5-inch display and OLED viewfinder; focus assist; neutral density filters and white balance. It will be available worldwide from December. In the U.S. it will cost $3,199 and in Europe it will cost €3,199. That price is a hike from the roughly $2,100 the predecessor HC-X1000 is currently selling for, but it's a cheaper beginning price. When the HC-X1000 debuted, it had a list price of $3,499. 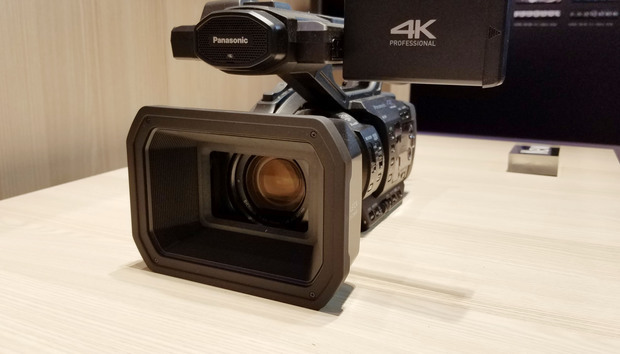 Panasonic's HC-X1 4K camcorder on show at IFA in Berlin on August 31, 2016.